We had a clear, warm autumn morning. A Red Admiral - one of the first of a wet, cloudy summer sadly devoided of butterflies - was sunning itself on the white wall of a garage. Without a doubt my favourite butterfly. On first sight they are plain black with white and orangey-red marks, but on close inspection, the black is actually a dark brown with a beautiful iridescent sheen in fresh individuals. The contrast and brigtness of the colours is fantastic. 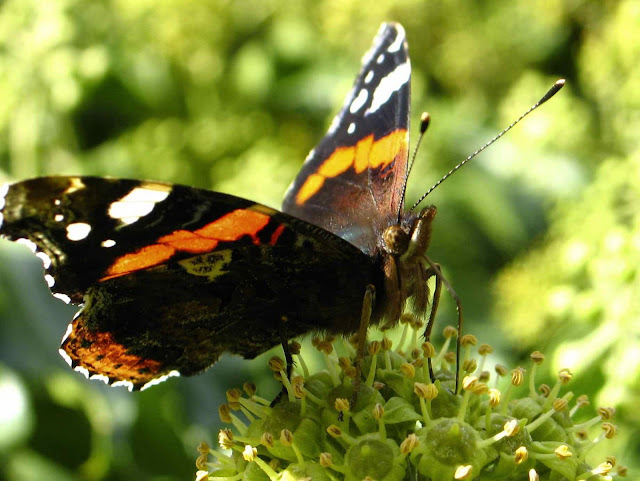 But lets leave aside the looks: what makes Red Admirals amazing is that they are migratory butterflies. They arrive in the UK and Northern Europe in the spring in large numbers, reproduce there and in the autumn they return to their winter grounds in Spain and North Africa. A pretty similar migratory pattern as swallows actually. Bird migration is well known by everybody, and there is lots written about it - although until the end of the XIX, swallows were thought to hibernate under water! However, I find insect migration even more extraordinary: that butterflies, moths and dragonflies, such little things, manage to find their way across continents often crossing large expanses of water - taking into account that no experience can be used, as due to their short lives each individual is only likely to make a one-way single trip in their lives - is just plain incredible. A paper I came across by an American team (Wikelski et al 2006) shows that progress is being made to understand insect migrations partly thanks to technological advances we could only dream about a few years ago. Researchers were able to attach miniaturized radio transmitters to the body of 14 individual dragonflies and track them during their autumn migration for up to 12 days using small airplanes and ground teams. This research showed that Green darner dragonflies follow simple migratory rules, with distinct stopover and migration days. They migrated every roughly 3 days covering over 50 km in 6 days in a generally southward direction. They migrated exclusively during the day, in days with low wind speeds, and chose to migrate only after after two nights of successively lower temperatures. Dragonfly migratory patterns and apparent strategy resemble those proposed for birds. You can watch a Green Darner fitted with the transmitter being released in the website. 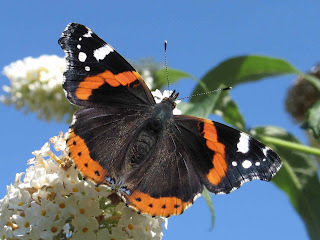 Although technology is still unable to reveal such detailed knowledge on butterfly migrations, a recent paper by Brattstroem and colleagues shows that information can be gathered from visual observations of migratory butterflies crossing straits or estuaries in the same way migratory birds are recorded: red admirals crossed the sea on sunny not too windy days and flew in a direction that minimised the distance to cross over the sea. 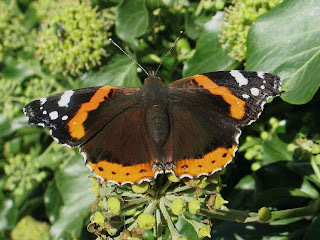 Despite this clear evidence for migratory behaviour, recent data actually suggests that the Red Admiral is overwintering in some numbers in the UK and there seems to be a trend in which this appears to happen in increasingly northerly locations. That individuals butterflies chose not to migrate and to spend the winter and others took on the migratory strategy is also fascinating. 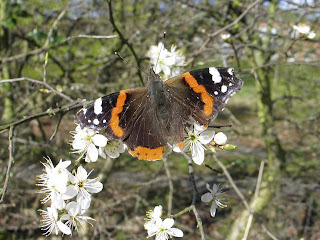 I wonder what this rough looking one, which I found feeding on blackthorn flowers a sunny april day had been up to.